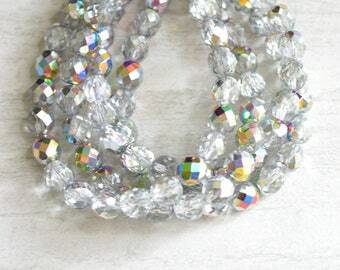 Beaded Statement Jewelry made by hand in the US. Announcement Welcome to DLD! 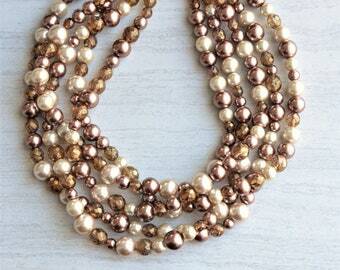 All of our statement jewelry is made by Dana LeBlanc with the highest quality beads and findings. DLD jewelry comes with a lifetime guarantee. Please read our shop policies before buying. + Free domestic US shipping when you purchase $60 or more. No code needed. + Enter "FREESHIPINT250" when checking out and get free international shipping for orders $250 and over. + Sign up for our monthly newsletter to receive product updates and coupons! Send an email to danaleblancdesigns [!at] gmail.com. Type "NEWSLETTER" in the subject line. + If you have issues placing your order or any questions, please call us at 336-645-5015. + Currently orders take 3-5 business days to produce, please let us know if you need it faster. + Visit our sister shop: www.etsy.com/shop/postqueen for more matching stud earrings! Welcome to DLD! 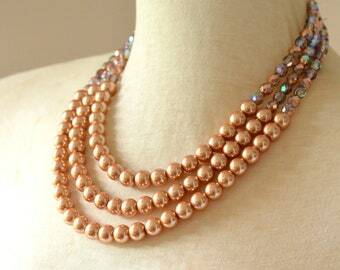 All of our statement jewelry is made by Dana LeBlanc with the highest quality beads and findings. DLD jewelry comes with a lifetime guarantee. Please read our shop policies before buying. DLD's take on Ultra Violet, Pantone's color of the year! 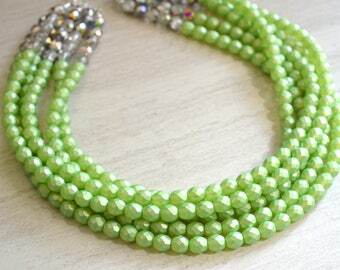 Dana's passion for jewelry design began when she started making bracelets for herself at age eight. As she grew older, the jewelry making evolved as friends and family urged her to create custom pieces for them. About 14 years ago, the once childhood hobby blossomed into a serious business endeavor. She started marketing through small specialty boutiques in 2004 and later established an online presence. Dana's designs combine a modern aesthetic with unique and often vintage components to create true statement pieces that are designed to be noticed. Every hand crafted creation is made to the highest quality standards and guaranteed for life. 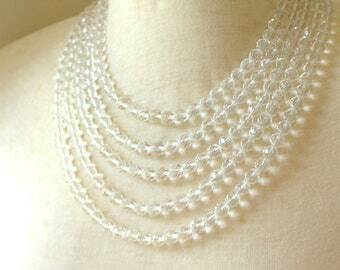 DLD jewelry is all handmade in the USA. Dana holds a degree in Interior Design from Appalachian State University and an MBA from Wake Forest University. She has been designing jewelry since she was a kid. For unsatisfactory or damaged merchandise, you will have 14 days after receipt of the item to return it to Dana LeBlanc Designs for credit, repair or alteration. Delivery date is based on tracking info. There is a 15% restocking fee that is applied to each item that is returned. The restocking fee can be applied to a future order. Returns MUST be approved by DLD before returning. If your jewelry breaks after the 14 days, it can be returned for repair. It will be covered by DLD, if it is "normal wear and tear". If we have to order replacement beads, there may be a charge. It will be evaluated on a case by case basis. Stud earrings cannot be returned due to hygienic reasons, please read the item's description carefully before buying. *If your items breaks over time due to normal wear and tear, please contact DLD to have it fixed. If possible, this will be done free of charge. *If you are an international customer and you want to exchange an item. Due to the high cost of shipping, you will be responsible for return shipping and the shipping to send the new item to you. - Once your package is mailed, the Postal Service or Fedex is in control of it. To protect your package against theft or loss, please let us know if you want to buy insurance. If you forgo insurance the package shipping costs can be recouped, but not product cost. *Paypal, American Express, VISA, or Mastercard and Venmo are accepted. Choose "other" for Venmo. *All items ship within 1-3 business days of receipt of paypal, credit card or e-check transactions. *Delivery outside the US can take 2-3 weeks. Faster shipping is available for an upcharge. *Wholesale inquiries are always accepted. *Custom designs require a 20% deposit and the deposit is non-refundable. *Custom orders can take up to 2-3 weeks to receive. Custom orders cannot be returned. A deposit is required for custom orders. Lead time varies depending on design and materials selected. Custom orders can not be returned or exchanged. We welcome wholesale, please contact us for more info. 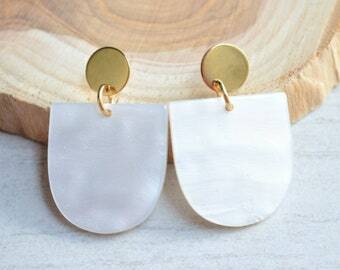 Store your chunkier necklaces flat-not hanging. Limit the use of lotions or perfumes near the jewelry. Silver pieces tarnish over time, airtight containers help. If needed, polish silver parts gently with polishing cloth. 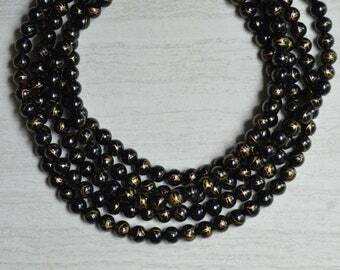 Matte bead necklaces should stored in the jewelry box they arrived in. 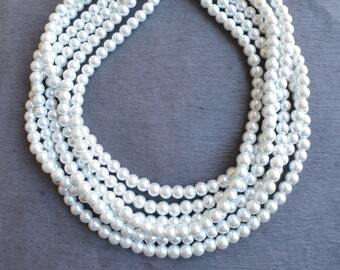 The length and number of strands can usually be modified. 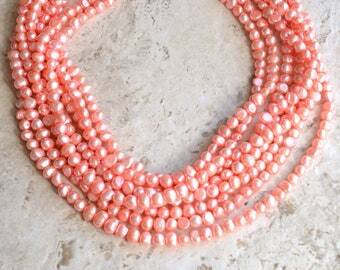 Smaller or larger bead sizes may be available. Please check all photos and product description before buying. 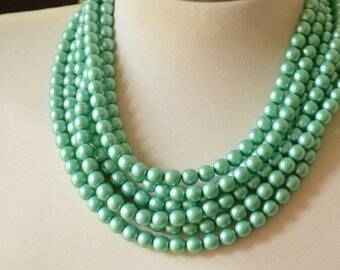 The "mannequin photo" will help you get a sense for the size of the beads and length. All DLD jewelry arrives in a silver jewelry box with a silver ribbon around it, unless otherwise noted. DLD For Men arrives in a brown kraft box with twine around it. For unsatisfactory or damaged merchandise, you will have 14 days after receipt of the item to return it to Dana LeBlanc Designs for credit, repair or alteration. There is a 15% restocking fee that is applied to each item that is returned. The restocking fee can be applied to a future order. Returns MUST be approved by DLD before returning. If your jewelry breaks after the 14 days, it can be returned for repair. It will be covered by DLD, if it is "normal wear and tear". If we have to order replacement beads, there may be a charge. It will be evaluated on a case by case basis. Once your package is mailed, the Postal Service or Fedex is in control of it. To protect your package against theft or loss, please let us know if you want to buy insurance. If you forgo insurance the package shipping costs can be recouped but not product cost. All packages come with a tracking number which is the basis for determining delivery time.